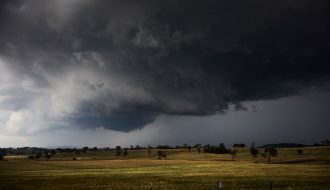 Storms were expected in the region near Newcastle today but one particularly serious storm complete with hook came through the Sydney region today making two days in a row of supercells! even better Jeff I was coming back from the bank :) posted earlier in the wrong (8/11) thread… "Might need to add the 9th to the title! We just had a nice, compact supercell through parts of Sydney. Got some video on the phone so will upload if ok. I was around Hunters Hill / Gladesville and the circulation came right over so will be interesting to see what the doppler scans reveal. Hail ~ 2cm, strong winds as the meso moved overhead. Cells were low topped, still some decent cgs around." Really nice doppler image showing probable mesocyclone and hook echo echo over Sydney right now! 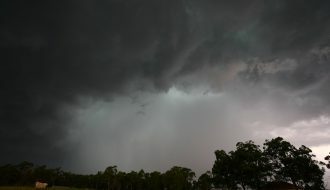 BoM issued a warning as it was hitting, true to form 8-( David Dave Croan I hope you are taking photos from your office! 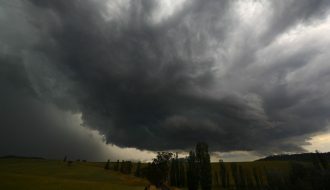 Severe Thunderstorm Warning with tornadoes issued for Tasmania! 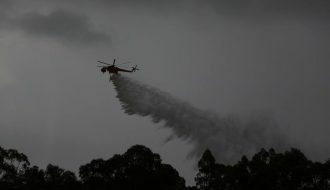 Yep, way too late on the warnings for Sydney basin AGAIN – what is wrong with their procedures? Here is a still of the best Doppler images from today’s storm over Sydney. Very impressive return! 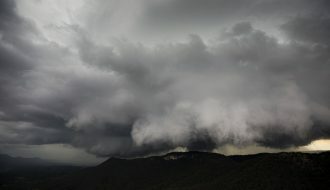 Caught a CG in a shelf cloud near home a little while ago. The storm became very lightning active for about 5 mins but not much either side. Hi Jeff and David, and take a look at the wind barbs on either side of the hook! 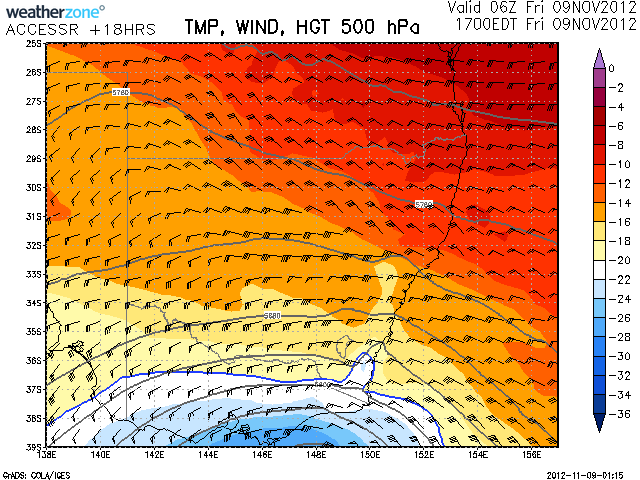 The low bases on this one really assists in the low level rotation tightening further down given the backed winds! Two days running and supercells! Not so common in previous years for Sydney – probably not since 2004! Nice daytime bolt Michael – did this storm show anything interesting on radar – any tighter base and you would you think it was cutting in! 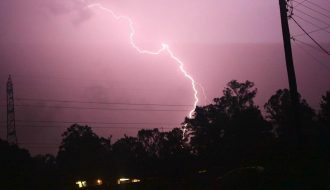 This was one storm I chased from Backtown. I watched cloud towers develop early and decided to drive to William Lawson Park at Prospect to take some photos. From there, I proceeded along the M4 to the Cumberland HWY, then went south towards Liverpool. I managed to intercept the storm at Canley Heights and I parked the car adjacent to a small park at the corner of Arbutus Road and Gladstone Street. Shortly after, the core of the storm passed overhead. At first, large raindrops began falling followed by wind gusts then some gales. I observed leaf stripping and small tree branches being removed from trees. The hail core then passed over me droping copious amounts of pea size hail and some larger hailstones (Actual size of the bigger stones not known). I was amazed at the amount of noise it made. At one point hail fall was copious and the larger stones were bouncing off the ground. I observed some hail drifts start forming around trees and fences. The storm cell was quick to pass and I would estimate no more than 10 minutes. The photo provided shows the rain and hail falling at an angle. Following the storm, emergency service vehicle sirens were heard quite possibly responding to callouts and problems created. I took several photos of the hail on the ground. The storm continued ENE and remained compact. A smaller storm cell developed near Parramatta and I managed to drive close to that one. That smaller cell was producing a short sharp rain shower as it tracked east towards the city. 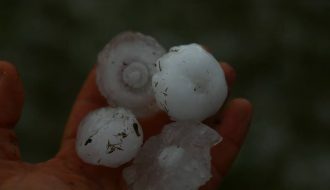 Nice video still of the hailstone action. 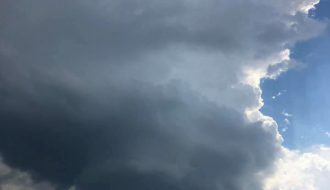 Do you have the pictures of the storm’s updraft there handy? Post them up – love to see them online! Excellent Harley. Im looking forward to Davids pics as well. I noticed the wind barbs too jimmy, love having a doppler. 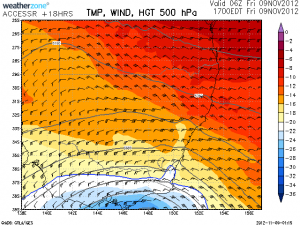 I am also interested by the nature of the two winds changes both days that have rsulted in two different supercell environments. I would not have thought that Sydney would cop it today I was thinking more close to Newcastle / Central Coast region. But alas it took off early! You bet Jeff Brislane, boundaries are essential part of storm chasing. Here is a photo of the storm cell looking south west as it was building. Taken at Prospect from William Lawson Park. I did see a pileaus cap on it. Shortly afterwards, I chased it down. I did see two cumulo congestus cloud towers east of the main updraft area as shown. It was relatively clear further west and north with smaller cumulus clouds evident. This was the cloud tower that caught my interest the most. 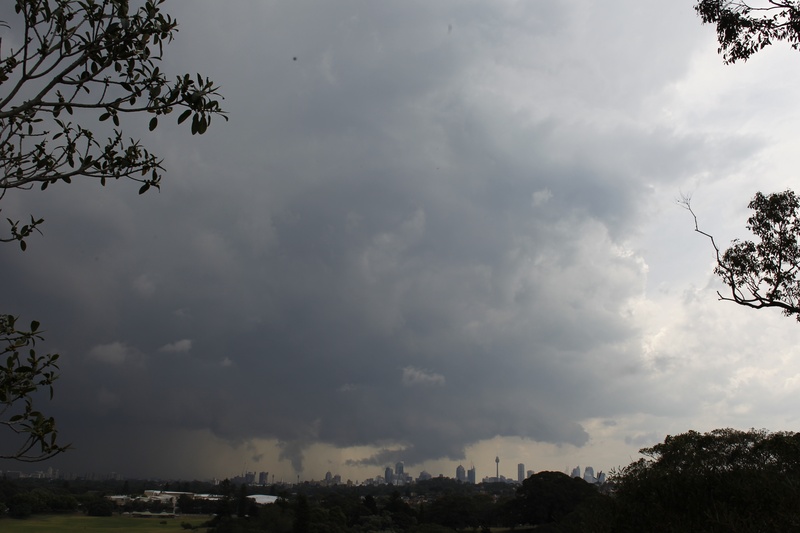 Of note and at about this time, there was a small but weak cell to the north that passed north of Sydney. This appeared to be weak and I did not take much attention to it. Interestingly and following the storm event, I noticed that the wind changed to the south east but was light.